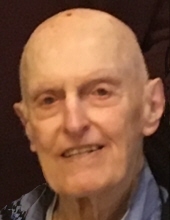 Robert L. Doty, 92, known to many as “Beno” passed away at 7:40 a.m., Wednesday, November 28, 2018 at his home in Rockford. Born July 30, 1926 in Rockford, IL the son of Mr. and Mrs. Walter D. and Norma O. (Winchester) Doty. He was a graduate of Pecatonica High School, Class of 1944. He married the former Mary J. Lietz on April 26, 1952 in Rockford, IL. He was employed by Seward Lumber Co and Barker Building Supply. Beno served in the US Army from 1945 to 1947 in the occupation of Korea. He was honorably discharged as a First Sergeant. He was a member of Eugene J. Barloga American Legion Post #197 in Pecatonica. He was a founder of Sumner Park in Pecatonica and he served as a commissioner for the Sumner Park District for 35 years. Beno truly enjoyed traveling, high school basketball, the Chicago Cubs and Bears and Notre Dame football. More than anything he loved family building projects and gatherings, his grandchildren’s activities and time at the family cabin (GLP) in Wisconsin. Survivors include his wife Mary J. Doty, Rockford, IL; six children Mary Kay Doty, Chicago, IL; Barbara L. Olsen, Rockford, IL; Steven C. (Tina) Doty, Elgin, IL; Mitzi E. (Dwayne) Williams, Machesney Park, IL; Joseph W. (Susan) Doty, Winnebago, IL and Jane A. (Kevin) Stivers, Winnebago, IL; 11 very special grandchildren; four great grandchildren; sister-in-law Betsy Doty, Pecatonica, IL; four nieces; three nephews and numerous cousins. He was preceded in death by his parents and brother Lee. A Memorial Mass will be held at 10:00 a.m., Friday, December 7, 2018 in St. Mary Catholic Church, 126 W Fifth Street, Pecatonica, IL with Father Ken Stachyra, pastor of St. Bernadette Catholic Church, Rockford, IL officiating. Cremation rites will be accorded. A visitation will be held at McCorkle Funeral Home-Pecatonica Chapel, 203 W Fifth Street, Pecatonica, IL from 4:00 to 7:00 p.m., Thursday, December 6, 2018 with the rosary to be recited at 7:00 p.m. In lieu of flowers, a memorial will be established by the family at a later date. To send flowers or a remembrance gift to the family of Robert L. Doty, please visit our Tribute Store. "Email Address" would like to share the life celebration of Robert L. Doty. Click on the "link" to go to share a favorite memory or leave a condolence message for the family.